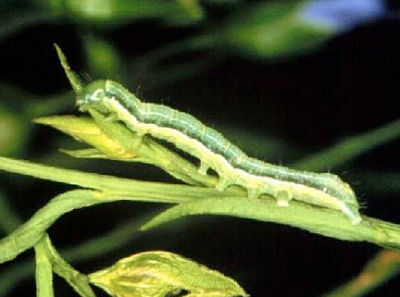 The three most common pod munchers are bertha armyworm, diamondback moth larvae and lygus bugs. Hot spots can sometimes be isolated to specific fields, so check each field. Before spraying, make sure insects counts are at or above economic thresholds. 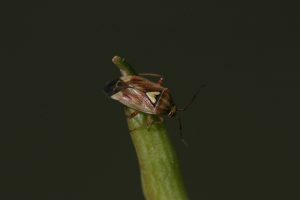 Applications made when insect numbers are below thresholds will not provide a positive return on investment and can do unnecessary harm to the many beneficial insects that help keep pest insect populations low. A few hotspots with higher bertha armyworm moth counts are showing up in Alberta, Saskatchewan and Manitoba. The economic threshold is the density of larvae where the economic value of the yield lost due to feeding equals the cost of control. Insect trap counts are generally low across the Prairies, but bertha counts keep rising. Here are the latest provincial survey results. 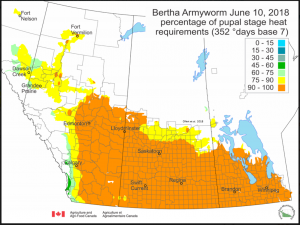 Growing degree days across most of the Prairies have reached the threshold for adult bertha armyworm (moth) emergence from overwintering pupae. That is 7-10 days ahead of normal. Egg laying begins shortly after adult emergence and young worms emerge about a week after that. Based on 2017 results, 2018 is not expected to be a bad year, but local flare-ups can occur. 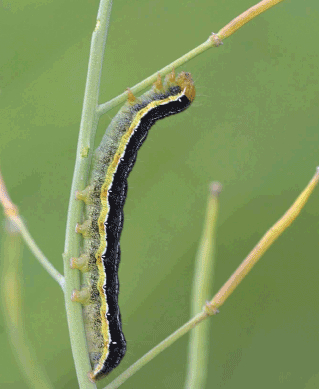 Reader question: Do bertha armyworms in 2017 indicate higher risk for 2018? 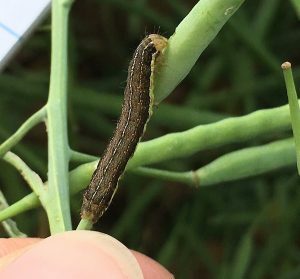 A reader from southeast of Saskatoon emailed this question: I had a field with bertha armyworms on the perimeter in 2017. Numbers were not quite enough to reach spray thresholds, but very close. (I likely should have sprayed the perimeter.) My plans are to seed the field next to it to canola this year. Will this second field likely have a bertha armyworm issue? A heavily-infested field in western Manitoba (south of Riding Mountain National Park) generated a lot of interest on Twitter in the past week. It prompted a lot of scouting, which is good. But what this one field and the ensuing scouting demonstrated is that bertha armyworm population spikes can be highly localized. Bertha armyworm adult moth counts were generally low across the Prairies in 2017. A few trap sites did enter the moderate risk level, but none was high. See provincial counts in the Prairie Pest Monitoring Network blog. However, as experienced with diamondback moth trap counts this year, egg survival could be higher in dry conditions and warm weather will promote rapid growth. While economic levels of damage have not been reported anywhere yet this year, individual fields could experience isolated high numbers. Why so few insects this year? Pod-eating insects — including bertha armyworm, lygus and diamondback moth larvae — are at low levels in general in 2016. The biggest factors regulating insect populations are (1) weather, (2) natural enemies and (3) competing food sources. Each is working in favour of lower insect pest pressure this year. 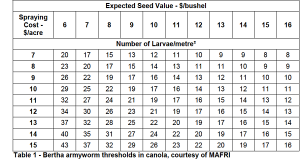 Berth armyworm moth counts are generally low (fewer than 300 per trap) across the Prairies, which means a reduced risk for worm damage over the coming weeks. 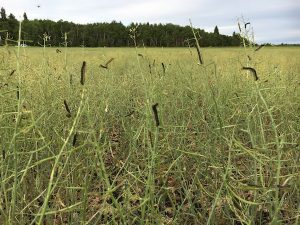 Before spraying, make sure your canola is at the right stage to be damaged by the worms and that the worms are actually the species you’re trying to control. Here’s how to tell the difference…. Diamondback moth larvae and grasshoppers have been reported, but so far nothing of widespread significance. 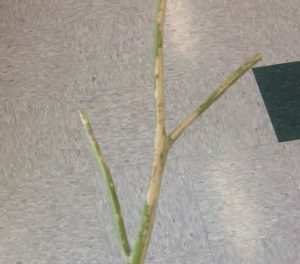 The photo shows what grasshoppers can do to a canola plant, but their damage is usually isolated to small patches. Bertha armyworm adult traps are coming down with very little in the way of hotspots. 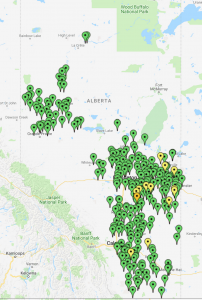 Lygus hotspots: Lygus numbers are high in some regions, with reports of 70+ per 10 sweeps in some fields in central and northern Alberta. Some fields will warrant a spray, but seeing the plane next door does not mean all canola in the area should get sprayed. Assess each field. Bertha armyworm hotspots: Berthas are a very low numbers in most areas, but there are a few hotspots. Bertha numbers can be high in one field, or even in areas within a field, and not a threat at all in fields close by. Assess each field.